I met up with Jodi again in the morning, as she kindly drove me over to get some tasty breakfast before heading to the day class at Revolution Dojo (the first time I had taken two classes at the same place during this Texas trip). Jeff was a little late for the warm-up, so Jodi ran the class through the usual running round the room and the like, followed up by the basic push-through triangle set up. Once Jeff arrived, it was straight into more triangle options, beginning like last time with something relatively fundamental before moving into the advanced set-up. The basic approach for today was the spider guard triangle. Start off pushing one foot into their hip while gripping their collar, the other knee pressing outwards into the crook of their elbow, your free hand gripping the sleeve of that elbow-arm. Shift to pushing the crook with your foot, then place the foot on their shoulder. When the moment is right, slide your foot over their shoulder and pull them in, then lock up a triangle. 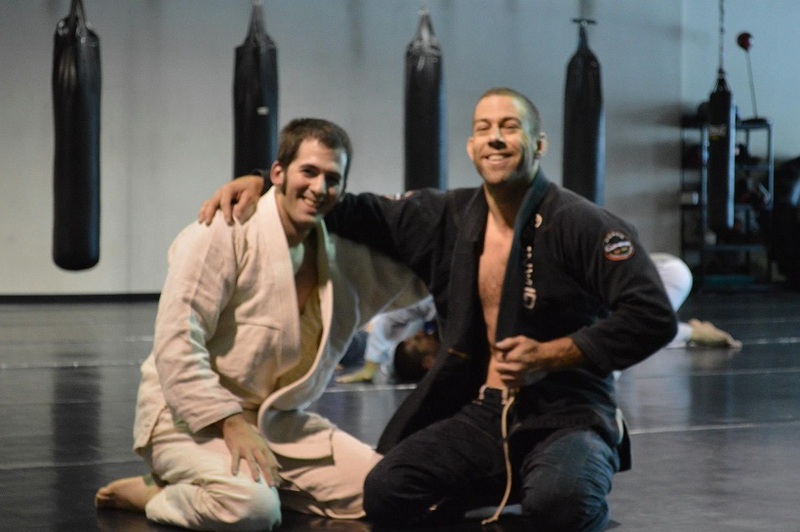 For more advanced students, Jeff demonstrated a triangle counter to deep half guard. They’ve established deep half and are looking to sweep. Underhook their far arm, sliding your free knee under their head so they end up essentially lying in your lap. Due to that underhook it should be difficult for them to turn, so you’re now waiting for the chance to pull your trapped leg out. You can either force it by pushing with your other leg (my injury meant that wasn’t possible), or wait until they loosen, then point your toes and pull the leg out. Once the leg is out, curl that leg around the underhooked arm and roll backwards a little. You don’t want to roll right into guard, because in a competition setting, they will get sweep points if they can escape the imminent triangle. Instead, roll just enough to get space to swing your other leg around to lock the triangle. It is possible to submit from there, but if you need extra pressure, base on your free hand then lift your hips, moving forwards. Sparring with Jodi was similar to yesterday, though I was trying more actively to get into half guard without much success. Jeff then offered to roll, which isn’t an opportunity you turn down: black belts generally have enough control to avoid hurting you even with a niggling injury. Like you would expect he controlled me easily, but without aggravating my hurt leg. I got caught in a choke again, so still not being careful enough of my collars, and I also got armbarred, so should watch it on extending my arm when I try to roll through to escape. I think I’m relying too much on defending the pass with a frame, where they sometimes end up balancing on my arms giving me space to bring in my knees. I need to remember to combine that with moving my hips and getting my knees in the way. Jeff and John both passed my frame quite easily, moving around my hands as if they weren’t there. I have been happily reading your write-ups of your trip. So glad you had a good time. Perhaps some day you'll find yourself in the Northeast! Your name came up when I was chatting with Jodi too (well, 'Shark Girl' did, but unless your family background is a lot more unusual that I'd expect, that isn't your real name ;D). It warmed my heart to see it confirmed that Jodi is as awesome, if not more so, than her online presence suggests. For Shark Girl, the myth is much more exciting than the reality. So, conjure up all sorts of strange family backgrounds . . . they're all true!